There are so-called cures for tinnitus out in the world today that range from pills to surgery. However, there is a reason these treatments remain unapproved by the FDA (Food & Drug Administration) – they simply do not work. 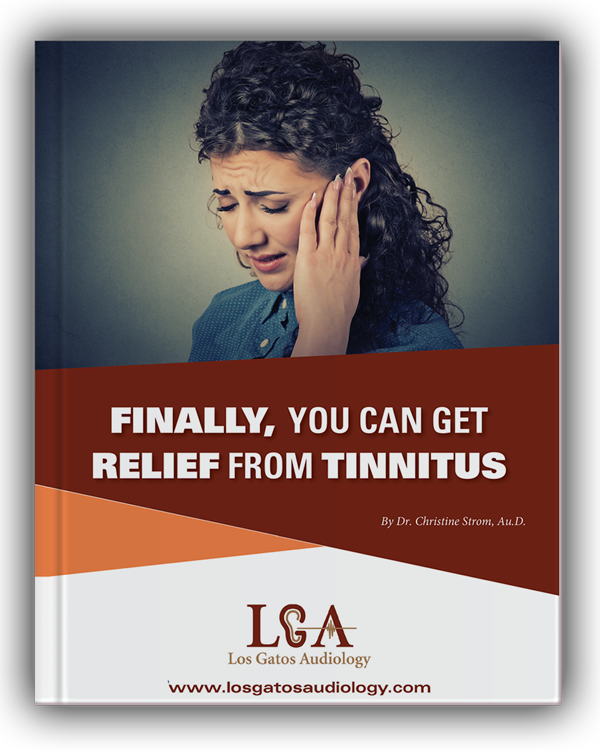 At Los Gatos Audiology, we have dedicated our efforts to fighting tinnitus with an FDA-approved therapy that has been clinically shown to reduce or eliminate ringing in the ears. Our experienced team is proud to provide risk-free tinnitus therapy in San Jose, CA, to help you combat the noise in your ears. Tinnitus is defined as a sensation of sound in your ears, or sometimes in your head. Each person with tinnitus has a different experience: patients have described sounds that range from ringing to whooshing to the sound you hear with your ear up to a seashell. Tinnitus is experienced by 80% of people with hearing loss. Some of these people only notice their tinnitus in a quiet room, whereas many others experience the sound all day long. Whether you experience tinnitus intermittently or constantly, we understand how much it can interfere with your daily life. The prevailing theory on why people with hearing loss experience tinnitus is called the ‘Central Gain’ theory. According to this theory, the sound you hear in your ears or head is caused by the loss of proper stimulation present in normal hearing individuals. In other words, because your brain is not properly stimulated by the ear, the brain attempts to make up for the missing stimulation, which results in over-exciting your system. This neurological phenomenon has been likened to the ‘phantom limb’ experience. Fortunately, there is a safe treatment option available today. In fact, the only FDA (Food and Drug Administration) approved treatment option for tinnitus is to provide your brain with the proper stimulation. There is no pill, no surgery, no other option available that is approved to treat tinnitus. Today’s treatment options are available for people with hearing loss, as well as for individuals with normal hearing. Most patients who undergo tinnitus therapy report a significant reduction in their daily tinnitus experience. Some even say the ringing disappears completely during the day! You don’t have to struggle unnecessarily with tinnitus. Visit our state-of-the-art hearing aid center to experience our tinnitus therapy in San Jose, CA, and learn how we can safely help you quiet the noise in your ears or head. Click the link below to schedule your complimentary Los Gatos Audiology Hearing Consultation today!